Dale Robert Gunn, beloved husband and father, passed into eternal life on September 14, 2018 at the age of 89. Funeral service for Dale will be 10:00 AM, Saturday, September 22, 2018 at the Niobrara County Auditorium in Lusk. Interment will follow in the Lusk Cemetery. Dale was born in Crawford, NE to Alex and Helen (Ring) Gunn on March 22, 1929. The young family lived on the Ring Ranch 20 miles north of Harrison for the first two years of Dale’s life. When he was two years old, they moved to the family home north of Lusk, near the Buck Creek Hills. He attended country schools through the 8th grade. While attending high school in Lusk, Dale boarded in town during the week and went home to the ranch on the weekends. He graduated from Lusk High School in 1948. Dale was a member of the First Baptist Church in Lusk, and confirmed his faith in Jesus Christ by being baptized there on February 6, 1994. Dale served in the U.S. Army during the Korean Conflict from January 1951 –March 1952. He served in the 40th Infantry Division as a rifleman carrying the BAR Browning automatic rifle. In the army Dale learned to play the harmonica, a skill that he and all his family enjoyed the rest of his life. At the end of the Korean Conflict, Dale was honorably discharged and awarded the Conduct Infantry Badge. In 1953 he married Coleen Dillon. They had three daughters; Rhonda Elaine, Dana Michelle (Shelly) and Tammy Jo. Dale and Colleen later divorced in 1957. Dale married Donna Reutzel on May 19, 1961. They had two daughters, Carmen Kay and Linda Marie. Dale and Donna purchased the John Hoffman place and the family lived there raising their daughters and ranching until they moved to town in the fall of 2015. Dale worked on the ranch all his life, where, out of necessity, he became an incredibly gifted mechanic. He developed a love for mechanics and he could fix almost anything. 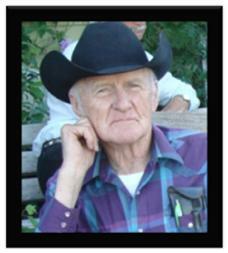 Dale had a special interest and love for old cars, pickups and tractors. As long as he was able, he was constantly working on some mechanical project. In addition to ranching, Dale and Donna drove school bus for the Fairview Country School for seven years. Dale worked in the Buck Creek Oil Field for 20 years pumping wells, hauling water, reseeding oil field locations and doing other various oil field work. Dale was hard-working, honest, dependable, loyal, responsible, self-sacrificing, humble and kind. He displayed these qualities every day of his life. Having grown up during the Great Depression, Dale was content with the simple things in life, wanting nothing more than to just enjoy the life he had always lived. Many were the recipients of his giving nature; he never sought a thank you or praise, but was willing to give of whatever he had if it made things easier on someone else. Dale took everyone at their word, seeing the best in all he met and knew. Dale loved his Country, his family, friends and his dogs. He especially loved old country music. Attending country music shows and jamborees brought him much joy, and he loved performing on the guitar and singing or playing the harmonica at jamborees. Family gatherings were always enjoyable when Dale would entertain with a song and get the whole family singing or toe tapping along. Dale loved his daughters dearly, but after raising five girls, he took great joy in having sons-in-law and grandsons. He enjoyed involving them in his interests; including mechanics, ranching or music. Dale always enjoyed a good joke. He had a quick wit and a contagious laugh. With a sparkle in his blue eyes, Dale was often up to something mischievous. Family members and neighbors didn’t mind being the target of one of Dale’s many pranks and couldn’t help but laugh along with the merriment that Dale took in pulling off his prank. Dale was preceded in death by his parents, Alex and Helen Gunn and daughter Linda Kaser. He is survived by his wife of 57 years, Donna Gunn, his sister Kathleen (Jim) Sullivan, his daughters Rhonda Holdbrook (Greg Saul), Shelly (Dwight) Krein, Tammy (Bob) Bonsell, and Carmen (John) Boussu, niece Shannon Collins, nephew Craig Turpin, thirteen grandchildren and twenty great-grandchildren. Funeral services for Dale will be held Saturday, September 22, 2018 at the Niobrara County Fairgrounds at 10:00 AM with Pier Funeral Home handling arrangements. Memorial donations can be made to the First Baptist Church in Lusk, the Niobrara Senior Center or the Niobrara Community Health Extended Care Facility. Pier Funeral Home in Lusk is in charge of the funeral arrangements.